Pro-Tech's In he pants / small of the back holster has a 30 day money back guarantee. Holster! Has Metal Clip and clip can be moved from one side to the other making this holster for right or left hand draw. Stitched with strong bonded nylon and double stitched at pressure points. Edges turned under to prevent fraying. 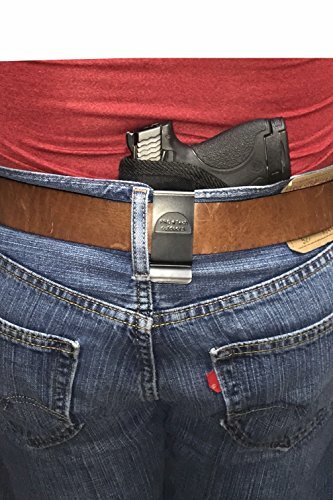 Order your in the pants holster today. Fits Ruger EC9s Make sure if your buying you buy from a Authorized Pro-Tech dealer. AS WITH MANY OTHER NAME BRAND PRODUCTS, THERE ARE LOOK-A-LIKE HOLSTERS. All Pro-Tech holsters have the Pro-Tech tag on the Holsters and come packaged in the Pro-Tech bag. BUY WITH CONFIDENCE, USA HOLSTER IS A AUTHORIZED PRO-TECH DEALER. 30 DAY MONEY BACK GUARANTEE!!!!! !